The contents of this article may seem obvious, but when I was a new teacher fresh out of college, no one went over the basics of living as an adult with me. My parents passed away shortly after I started my teaching career, and I had to learn these financial survival skills from the school of life (or the school of hard knocks, depending on your perspective). Had I a mentor who had walked me through the future scenarios which I would now be experiencing, I might have made a number of decisions differently that would have improved my overall standard of living. 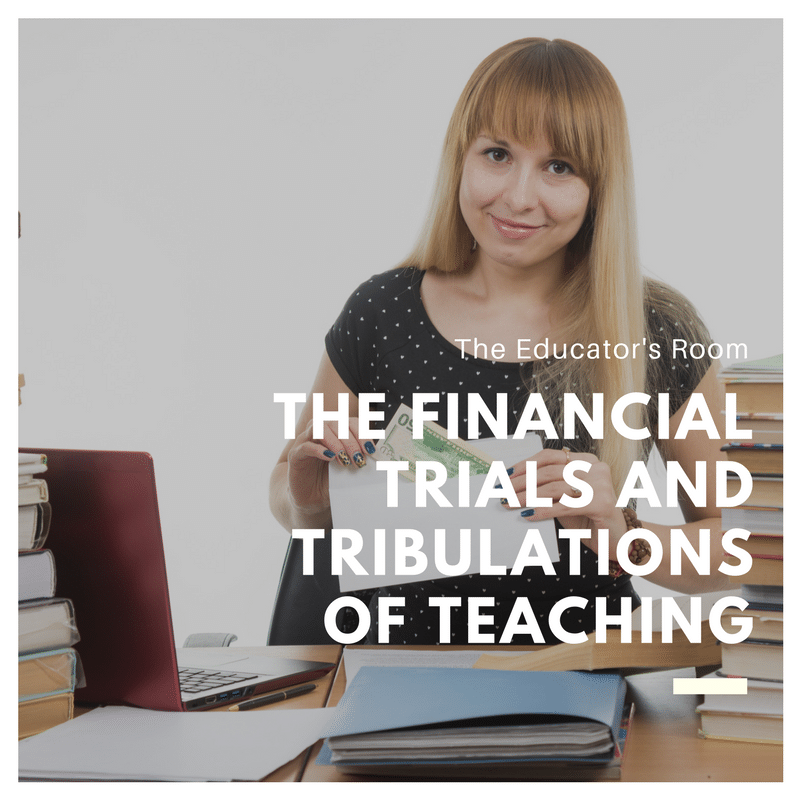 Teaching is a job that carries a high level of prestige but a relatively low level of financial compensation. According to salary.com, “The median annual Public School Teacher salary is $55,072, as of January 30, 2018, with a range usually between $48,080-$63,581” (emphasis not mine). Teachers with greater experience and education move up the salary scale, but moving up the salary lanes of your school system involves an additional investment of financial capital and time. If you’re a recent graduate, you may be paying off student loans. Just starting out on your own forces the young teacher to make important financial decisions early on. It is so important to lay a strong foundation for the future by establishing good habits early in your professional life. Here are just a few things to think about. Just after moving to my current school system, teachers received a 15% pay increase to stay competitive with surrounding school systems. It was a good financial move. But it was offset by the divorce process which I experienced almost simultaneously. Divorce is costly not only in an emotional sense but a person’s financial house is basically torn in two. Depending on how things go, a teacher might be forced to sell the house. I chose to buy my ex-wife out, refinance the house, taking on the mortgage on my own so that my three kids would have a consistent environment in which they could grow and flourish. She received a check for half of the equity of the house, and I lost her earning power as a member of the family. To make matters worse, she was the primary caregiver for the kids, so she received a child-support payment that made paying my other bills even more difficult. Home ownership is a massive financial liability. The house requires upkeep, investments in refurbishing and remodeling, emergency purchases of plumbing and roofing, as well as regular monthly expenses of electricity, cable, internet, and phone. My debt ratio skyrocketed. To feed the kids, put gas in the car, and make my bills, I used credit to stay afloat. I supported my family with health insurance, childcare costs, and joint custody of the kids. In the long run, I am thankful I am still in my house fifteen years later, but I have made little or no progress of getting out of debt. The moral of the story: mend it, don’t end it. Unless you’re experiencing physical, emotional, or verbal abuse, do what you can to stay with your spouse, not just for financial reasons, but for emotional reasons too. The improved financial situation makes up a long-term benefit of the sacrifices that you might be willing to make to stay married. In the paragraphs above, you can see that discretionary income was rare, so putting something away each month for retirement was not an option for me. Only later in life did I make the decision to use direct deposit to invest in a private retirement fund. My school system matches a deduction from my bi-weekly paycheck into the state retirement fund, and I pray this fund is never raided by the state legislature to balance the state budget. The state system can tell me what I’ll receive if I make it to year thirty as a teacher, but most financial advisers state that you should have ten times your annual salary saved up by the time you retire. I probably won’t make that goal, but if you start early enough, you can secure a reasonable standard of living in your golden years. I write to you as a single dad, fifty seven years old, thirty-four years in education, over ten thousand dollars of credit card debt, 22 years left on a thirty year mortgage (due to several refinances in the wake of the divorce), and I am about to become an “empty nester.” I make a good salary, but I never feel as though I have enough money to live a “normal lifestyle.” My credit rating is good because I pay my bills on time and I pay above the minimum on my credit card bills, but my expenses are such that it does not feel like I am ever making progress in paying down my debt. I am the poster child for someone who lives paycheck to paycheck. Don’t be like me. Have a strong savings account that could carry you for six months to a year if you needed it. I know financial progress means eating at home more often than going out. Frivolous purchases such as a daily visit to Starbucks (called “the latte factor”) add up and can be used to buy groceries for you and your family. Making purchases that come directly from checking rather than on credit would reduce the amount of interest I am paying on my various credit cards. Driving the same car beyond the point where it is paid off allows the car payment to be diverted to paying off debt or into savings. These little sacrifices add up and can make the difference when it comes time to pay the bills. One more recommendation: I keep a spreadsheet in Excel with all my bills, their due dates, payments, and passwords. I save it under a new file name as the new month begins so I have a record of all monthly transactions. Even if I am paying the same amount on my credit cards and other monthly expenses, this arrangement helps me track purchases and payments. There have been too many instances over the years where I have run out of money before I run out of the month. A friend who is a close confidant said to me that if just cutting expenses is not achieving the goal, then you have to increase revenue too. So I am writing as a freelance contributor to this and other websites. I have published a book of Civics lesson plans, which provides a modest amount of royalties. There are websites such as TeachersPayTeachers.com where the work you do in the classroom can be marketed, monetized, and used as a source of additional income. I also tutor homebound students after my school day ends several days a week, which adds to my take-home pay. I am also a teacher of world history online for my school system, all of which adds time to my workday, but I am processing student work at home and at a time of my own choosing. I have become an expert time budgeter, juggling all of these balls, bringing home a little more disposable income to pay my bills and offer myself a modest level of middle-class living. I am using my talents in a way that maximizes my value to my school system while improving my financial standing. Nevertheless, had I made better financial decisions when I started my career, I could have achieved greater financial success as my career now comes to a close in the middle-distant future. I offer these recommendations to you so that your future as a teacher may be a brighter one.